When wearing nice and stylish looking suits is what you're all about, adding some new french cuff dress shirts that come with matching tie sets is a great way to keep your public guessing what you're going to be seen wearing next. 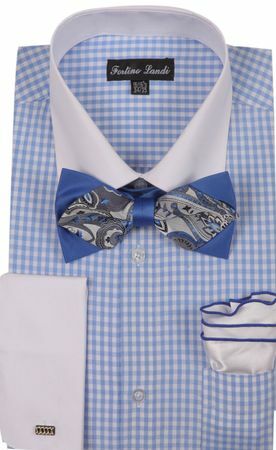 This light blue square pattern shirt and tie set is made by Milano and features a white collar and french cuffs with the fancy matching bow tie combination as well. Fabric is wrinkle resistant Cotton/Poly 60/40 for easy care. Find More Mens French Cuff Dress Shirts Here.